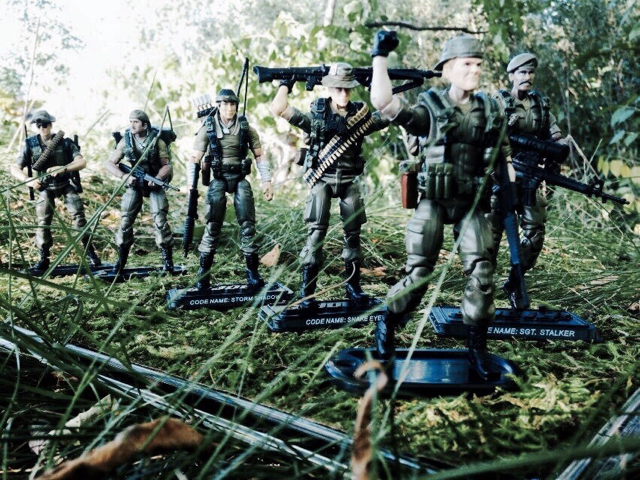 Sorry, I just dont see this new generation flocking to military toys like we did in the past. But a movie tie in with G.I. Joe is a good idea. Isn't Call of Duty a video game? Dont get so easily offended. We are just having a conversation. Let's just agree to disagree without the personal attacks. If I were to do what some are doing (making generalizations), using the term 'social justice warrior' would paint someone as a Trump loving, racist, homophobe. Now, I dont think most people who use the SJW term are any of those things. Heres the cool thing about people. We are complex creatures. I am liberal (you probably would classify me as a SJW - speaking of which, why should wanting everyone to be treated equally and with respect held in such poor reguard that it becomes an insult? ), but love guns, military vehicles, aircraft, tech. I vote for those horrible democrats but respect John McCain and a few republicans. I support Black Lives Matters and work with and respect cops. I love this country, but am ashamed of things it has done. Sorry man, but a few people were right. This is not the 1980's. Nationalism and loving America is differnt now. Nationalism should not mean I love America and f**k everyobe else. Nationalism should not be worshiped, patriotism should be what we strive for: we should live this country, but understand and see that we are leaders to the world. We should help the people who are in need because its the right thing to do. Be a role model to the world. Where am i going with this? The world isnt going to want to watch a 1980's style movie that is nationalistic and has a message that says 'America yes, anyone else is our enemies. Top gun was a good movie, in its time. If you watch it again, its very cheesy and hokey because its so dated in its nationalism and end of cold war reminders. ROC had some parts right, but the execution was poor. The Joes should be an American Special Forces team that has international fighters. There are things the US does well, but there are things other countries do well. I would love to have Russian, Israeli, and British special forces on the joe team. M. Bay may have made 'billions' off of his pro military movies, but it that does not make the movies good. I dont recall people lined around the block to watch the last few poorly written Transformer movies. If they were kined up, it would be to watch giant transforming robots, not because they feature the US Military. Last edited by nightrattler; 10-09-2018 at 01:00 PM..
Chill out man and quit with the broad generalizations. If I were to do what you are doing (making generalizations), using the term 'social justice warrior' would paint you as a Trump loving, racist, homophobe. Now, I dont think you are any of those things. Nightrattler it wasnt Solo I used the term SJW first in a previous post. Apologies if it offended that was not my intent. My point got lost in translation. I caught that and edited my post. Sorry man. I wasnt offended. The SJW thing just bugs me as it just gets thrown around without really thinking about it and it bugs me. Which i guess is the point by the people who sling it around. Last edited by nightrattler; 10-09-2018 at 01:37 PM..
Also it should be said that one big reason Michael Bay prominently and patriotically features the military in his movies is not out of some love of country, but because he gets free stuff from the government for his movies, which makes it cheaper to make so it helps the bottom line. There's a department in the Army that you can submit your screenplay to to get "cooperation" i.e. free vehicles and troops to show up in your movies if they approve of the script. If I were to do what some are doing (making generalizations), using the term 'social justice warrior' would paint someone as a Trump loving, racist, homophobe. Because, as a practical matter, it's impossible to treat everyone equally (as you admit, people are complicated and often difficult, as individuals, to precisely categorize) and respect is something that must needs be earned, not given away to all and sundry like a pre-school participation award. I vote for those horrible democrats but respect John McCain and a few republicans. Sorry man, but a few people were right. This is not the 1980's. Nationalism and loving America is differnt now. Nationalism should not mean I love America and f**k everyobe else. In terms of American culture, "My Country, Right or Wrong" (or similar sentiment) goes back to the 1820s, at least. Nationalism should not be worshiped, patriotism should be what we strive for: we should live this country, but understand and see that we are leaders to the world. We should help the people who are in need because its the right thing to do. Be a role model to the world. That seems like a bit of a strawman. I don't think anyone here is asking for some kind of "if you're not with us, you're against us" Global War on Terror propaganda piece, but trying to take a belt sander to any given property to grind off the culturally-distinct bits in the interest of (hoped-for) greater global sales potential is pretty much a textbook example of commercialism killing art. I prefer the way Larry Hama handled it in the Marvel comics, with the Joes having to work with their opposite numbers on the Oktober Guard from time to time. It would be fun to see more fictional or fictionalized spec-ops teams from different nations in the G.I. Joe universe, but speaking, again, as a non-American, I don't want the Joe team itself to start getting filled up with international tokens. That's true, but I think Michael Bay also un-ironically loves the U.S. military for purely aesthetic reasons. Here's the best answer to the thread's question, No. G.I. Joe is in Bumblebee as much as the Dire Wraiths from Rom are in the Last Knight. Aren’t you the evidence guy? Don’t see how a definitive “no” can be given.